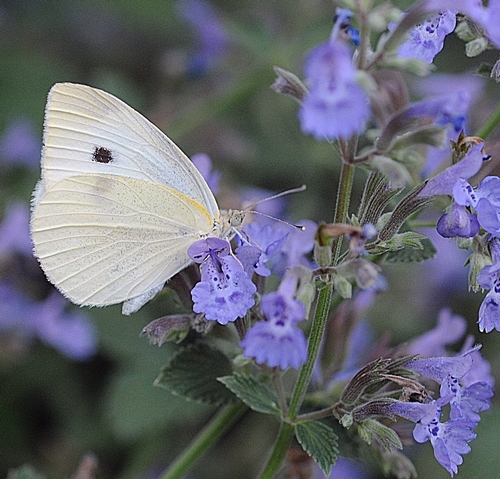 The cabbage white butterfly (Pieris rapae) looks like a Lady in White when she perches on catmint. The colors are striking: A long, flowing white gown nestled among the rich lavender blossoms and earthy green leaves. UC Davis Butterfly expert Art Shapiro says this insect flies an average of 44 weeks of the year in the Davis-Sacramento area. It seems to particularly love the catmint in our garden. Last night, however, it was flying in our kitchen. There is no catmint in the kitchen. There is only a cat. The confused butterfly probably entered the kitchen through an open door--or the cat door. My mission: Rescue the butterfly bouncing around in the kitchen and let it go before the cat, aka Xena the Warrior Princess, developed a culinary interest in it. Back to the catmint it went. I did not take it to Shapiro and ask "Did I win?" You see, every year Shapiro sponsors a cabbage white contest in the Davis-Sacramento area. 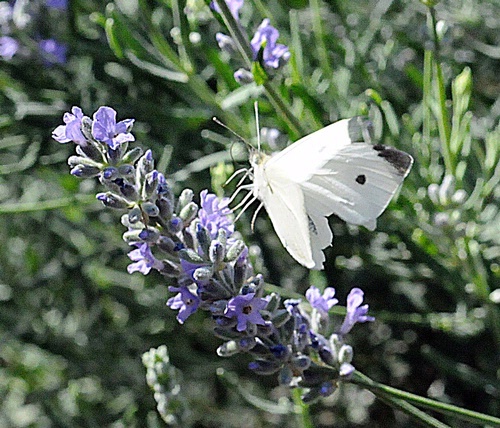 The first person who delivers a cabbage white to him, starting the first of the year, wins a pitcher of beer. The contest always ends in January or February. "Almost every year," he says, "someone brings one in May or June and asks 'Did I win?'" No losers this time, though. The Lady in White won. She won the how-to-get-out-of-the-kitchen-unscathed-and-back-to-the-catmint contest. "Omigosh, what's that? 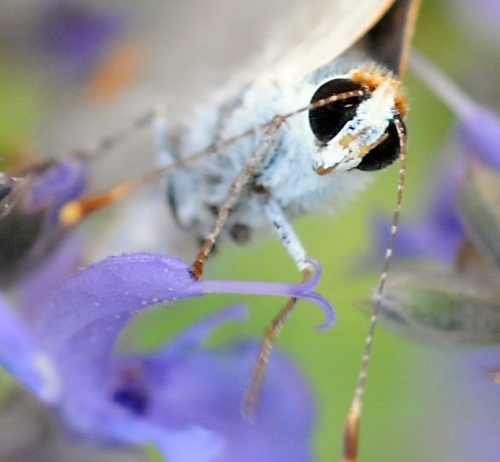 A gray hairstreak?" If it's in your hair, you consult a mirror, your favorite salon, or just ignore it. If you're an entomologist or a lepidopterist, a gray hairstreak is delightful. "Omigosh, check that out! A gray hairstreak!" A gray hairsteak is a butterfly (Strymon melinus). It’s basically gray with a large orange spot near its tail. It probably derives its name from the fine gray hairlike markings that cross the undersurface of the hind wings. 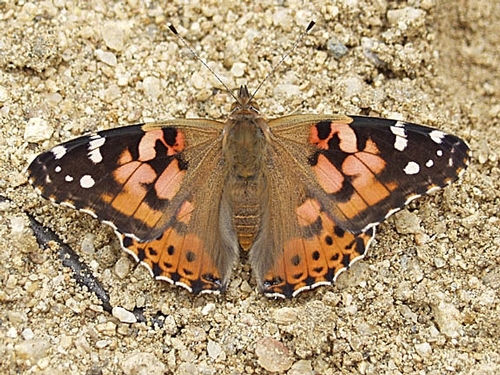 If you look closely, you’ll see threadlike tail projections, resembling antennae. It’s not a beautiful butterfly, as butterflies go, and oh, do they go! Fast and low-flying, it is difficult to photograph. If you catch it nectaring, that’s your best shot. 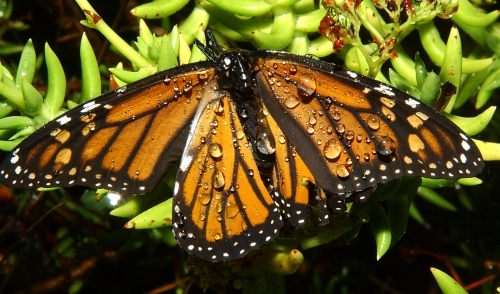 In its caterpillar stage, it damages bean, corn and cotton crops. 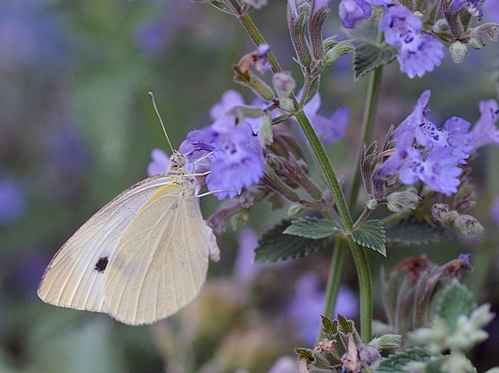 Renowned butterfly expert Art Shapiro of UC Davis, who maintains an excellent butterfly Web site, says hairstreaks belong to the subfamily (Theclinae) and the gossamer-wing butterfly family (Lycaenidae). 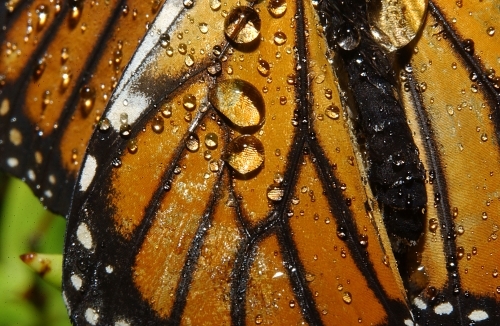 "The gossamer-wings are a very diverse and complex family with at least 4750 species worldwide," he says. "In California, they can be grouped into the coppers (subfamily Lycaeninae), the blues (subfamily Polyommatinae), and the hairstreaks (subfamily Theclinae)." 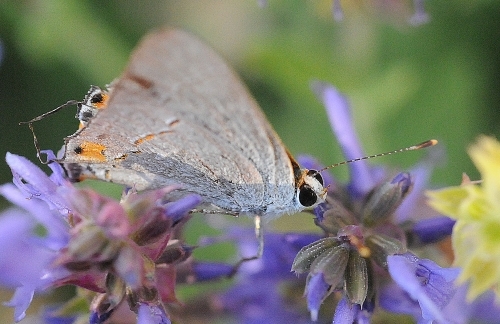 The gray hairstreak is considered a weedy butterfly. "Weedy," as Shapiro explains on his Web site, "is a general term for organisms that are typically associated with habitats that are disturbed by human activities or are dominated by non-native, invasive plants." Adults visit an immense variety of flowers, both wild and cultivated, says Shapiro. Indeed, the gray hairstreak is one of the most polyphagous butterflies known; it feeds on scores of different flowering plants. 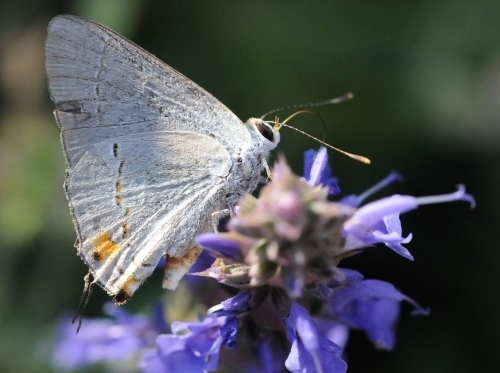 In our bee friendly garden, a male gray hairstreak nectared last weekend on sage, sharing it with assorted honey bees. Then like a streak, he was gone.